Median preoperative (pre) and postoperative (po) levels of procalcitonin (A) and C-reactive protein (CRP) (B) in the patient groups with septic multiorgan dysfunction syndrome (MODS), septic single-organ failure (SOF), and sterile courses irrespective of organ failure. Asterisks indicate significant differences in patients with MODS vs the 2 other groups (P<.05). Error bars represent interquartile ranges. Median levels of procalcitonin (A) and C-reactive protein (CRP) (B) in nonsurvivors and survivors with secondary peritonitis. Asterisks indicate significant differences between nonsurvivors and survivors (P<.05). Error bars represent interquartile ranges. Receiver operating characteristic analysis of procalcitonin (PCT) and C-reactive protein (CRP) in assessing overall prognosis (survival vs nonsurvival) in secondary peritonitis in the first (A), second (B), and third to fourth (C) weeks after disease onset. Differences in the areas under the curve in PCT vs CRP were significantly different in favor of PCT: first week, P = .008; second week, P = .001; and third and fourth weeks, P = .04. Hypothesis Infections and sepsis are major complications in secondary peritonitis and still represent a diagnostic challenge. We hypothesized that the laboratory marker procalcitonin would provide an early and reliable assessment of septic complications. Design Prospective, international, multicenter inception cohort study. Setting Five European surgical referral centers. Patients Eighty-two patients with intraoperatively proven secondary peritonitis were enrolled within 96 hours of symptom onset. Main Outcome Measures Procalcitonin and the laboratory routine marker C-reactive protein (CRP) were prospectively assessed and monitored for a maximum of 21 consecutive days. Results Procalcitonin concentrations were most closely correlated with the development of septic multiorgan dysfunction syndrome (MODS), with peak levels occurring early after symptom onset or during the immediate postoperative course. No such correlation was observed for CRP. According to receiver operating characteristic analysis, a procalcitonin value of 10.0 ng/mL or greater on 2 consecutive days was superior to a CRP level of 210 mg/L or greater for predicting septic MODS, with sensitivity, specificity, and positive and negative predictive values of 65%, 92%, 83%, and 81% for procalcitonin and 67%, 58%, 49%, and 74% for CRP, respectively (P<.001). Assessment of septic MODS was already possible on the first 2 postoperative days, with similar sensitivity and specificity. Persisting procalcitonin levels greater than 1.0 ng/mL beyond the first week after disease onset strongly indicated nonsurvival and were significantly better than CRP in assessing overall prognosis (P<.001). Conclusions Procalcitonin monitoring is a fast and reliable approach to assessing septic MODS and overall prognosis in secondary peritonitis. This single-test marker improves stratification of patients who will develop clinically relevant complications. Facing this clinical dilemma, there is major interest in the search for an optimum diagnostic tool for an early, noninvasive, and reliable diagnosis of abdominal infections and sepsis.8 Clinical scoring systems allow satisfactory prediction of overall prognosis9-14 and are an established means of interinstitutional comparison of patient groups for study purposes. In contrast, biochemical variables for stratifying disease severity in secondary peritonitis are poorly studied, with inconclusive results due to noncomparable study populations and nonstandardized assay techniques.15-23 Up-to-date, critical care–derived scoring systems and biochemical markers have not been shown to be reliable for indicating infection and associated sepsis in patients with secondary peritonitis.24 Currently, radiologic imaging procedures (eg, contrast-enhanced computed tomography) and guided aspiration techniques (eg, fine-needle aspiration) are frequently used to diagnose septic abdominal complications.8 However, the demand for high-standard technical equipment and personal experience and the potential risk of complications do not render these procedures easily available and cost-effective. An accurate and readily available biochemical marker for identifying patients at risk for abdominal infections would definitely contribute to easier and safer diagnosis. Procalcitonin is the inactive 116–amino acid precursor of the biologically active hormone calcitonin. In 1993 Assicot and coworkers25 first described significantly increased concentrations of procalcitonin in patients with bacterial and fungal infections and sepsis. Hence, it has been largely confirmed that procalcitonin is the only one in a large array of biochemical markers that closely correlates with the inflammatory host response to microbial infections.26,27 In peritonitis, only 2 studies22,23 have ever been conducted, to our knowledge, investigating the usefulness of procalcitonin in monitoring the postoperative course after surgical treatment. Both studies22,23 have shown that procalcitonin is a reliable indicator of nonsurvival. However, neither study assessed the potential of this marker for predicting septic complications. In the absence of representative studies, we addressed this issue by conducting the first prospective, international multicenter trial in patients with secondary peritonitis. Patients were recruited between December 1, 1999, and March 31, 2004. Participating centers were the Department of General Surgery, University of Ulm; the Department of General, Visceral, and Vascular Surgery, University of the Saarland; the Department of Surgery, Helsinki University Central Hospital; the Department of Surgery and Gastroenterology, Pancreatic Unit, University of Verona; and the Department of Visceral and Transplantation Surgery, University of Bern. All patients with intraoperatively proven peritonitis were eligible for the study. Inclusion criteria were defined as (1) an interval between the onset of typical abdominal symptoms and study inclusion of 96 hours or less, (2) the presence of systemic inflammatory response syndrome,28 and (3) written or verbal informed consent according to local rules. General exclusion criteria were (1) an interval between the onset of abdominal symptoms and study inclusion greater than 96 hours, (2) the absence of systemic inflammatory response syndrome, (3) younger than 18 years, (4) hepatitis B or C or human immunodeficiency virus infection, (5) psychoses except delirium tremens, and (6) peritonitis as a complication of previous elective or emergency abdominal surgery. Intra-abdominal bacteriologic specimens were obtained from all the patients. Beyond the intra-abdominal bacteriologic analysis, microbiologic cultures from central venous and arterial lines, blood, bronchoalveolar fluid, or urine were collected and documented when new-onset or persisting infection or sepsis was suspected. Specific organ failure was defined as follows: pulmonary failure, arterial PO2 less than 60 mm Hg at room air or mechanical ventilation; renal failure, creatinine concentration greater than 2.0 mg/dL (>180 μmol/L) or hemofiltration/dialysis; and shock, systolic blood pressure less than 80 mm Hg for more than 15 minutes or pressure support. Multiorgan dysfunction syndrome (MODS) was defined as the presence of 2 or more failing organ systems requiring specific ICU treatment, such as mechanical ventilation, hemofiltration/dialysis, or pressure support. Septic MODS was defined as MODS in the presence of an infective focus documented by positive bacteriologic test results. Postoperative treatment comprised ICU support and antibiotic drug treatment according to local guidelines. Procalcitonin (upper reference limit, 0.5 ng/mL) was prospectively analyzed in a real-time manner at each study center using a semiautomated chemiluminescent immunoassay (LUMItest PCT; Brahms Diagnostica AG, Hennigsdorf, Germany). C-reactive protein (CRP) (upper reference limit, 5 mg/L) was determined as a routine marker using automated analyzers at each center. The 2 markers were assessed for a maximum of 21 consecutive days and thereafter weekly until hospital discharge or death. APACHE II (Acute Physiology and Chronic Health Evaluation II)29 and sequential organ failure assessment30 scores were calculated at 24-hour intervals after study inclusion throughout the observation period. All clinically relevant data, such as results of diagnostic imaging procedures, surgical procedures, type and duration of specific ICU and antibiotic drug treatments, vital signs, and routine laboratory variables, were documented in standardized case report forms. At 6-month intervals each patient's completed case report form was reviewed at an investigator's monitoring visit to ascertain eligibility for the study and check for appropriate documentation. Each study center obtained approval from the local research ethics committees. The end points analyzed were bacteriologically proven abdominal infection with and without organ failure or MODS, septic organ failure or MODS in general, and nonsurvival. Descriptive data are given as absolute numbers (percentages) or as medians (interquartile ranges or 95% confidence intervals [CIs]). We compared independent samples using Wilcoxon rank sum tests and proportions using Fisher exact tests. P<.05 at an α<.05 was considered statistically significant. Receiver operating characteristic (ROC) curves and the respective areas under the curve were calculated for the maximum value of each marker reached on at least 2 days during the observation period to determine overall cutoff levels for the prediction of complications. To assess the early predictive value in the postoperative course, the highest procalcitonin and CRP concentrations on the first 2 days after surgical treatment were subjected to ROC analysis. The best cutoff value was chosen as the value that maximized the phi statistic based on the Pearson χ2 test. The predictive power of indicators was also demonstrated by calculating sensitivity, specificity, positive predictive value, and negative predictive value of the sample in the usual way, using the optimal cutoff value. Ninety-one patients were enrolled in the study; 9 of these patients were excluded because they did not meet the inclusion criteria, resulting in 82 eligible patients. The biological data and the cause of peritonitis are given in Table 1. Only 3 patients experienced a malignant disease as the underlying pathologic abnormality for the peritonitis; in the remaining patients, benign diseases were present. The median interval between symptom onset and study inclusion was 33 hours (range, 2-95 hours), with no differences between study centers. No center-dependent age differences were observed; small-bowel perforations were the leading cause of peritonitis in patients at the University of Ulm (44%, n = 14; P = .02). Disease severity in terms of APACHE II and sequential organ failure assessment scores in the first 24 hours after study inclusion, the incidence of local and infectious complications, and treatment are summarized in Table 2. Bacteria-positive peritonitis was found in 56 patients (68%) during the initial operation, and 2 patients with an initially sterile intraoperative bacteriologic profile developed postoperative intra-abdominal infections (infected pelvic hematoma and liver abscess). The intraoperative bacteriologic results in all the patients with intra-abdominal infections (n = 58) revealed gram-negative bacteria in 20 patients, gram-positive bacteria in 10, and mixed gram-negative and gram-positive bacteria in 22. Fungal infections with Candida species were found in 9 patients (6 patients with Candida only and 3 with additional bacteriologic infections). In 49 of the 58 patients, a complete microbiologic differentiation of the isolated organisms was available. Escherichia coli was the most frequent organism isolated (n = 26), followed by Enterococcus (n = 9), Streptococcus (n = 8), Bacteroides (n = 7), Staphylococcus (n = 8), Enterobacter (n = 5), Klebsiella (n = 2), and others (Prevotella and Clostridium, n = 1 each). Thirty of 58 patients with a bacteria-positive intra-abdominal focus but only 4 patients without any evidence of an infectious focus developed MODS. One patient developed virus-induced septic MODS, whereas all the bacteriologic specimens taken from other sites, including the abdomen, had been negative. Repeated operations were necessary in 6 patients due to persisting abdominal sepsis and associated septic MODS. Persisting septic MODS despite surgical control of the abdominal focus was the cause of death in 8 of 9 nonsurvivors (1 patient died of myocardial infarction). Remote organ failure developed in half of all patients, and mortality was 11.0% (Table 3), with no study center–specific differences except the need for mechanical ventilation (P = .02). The overall procalcitonin release was expressed most in patients who developed septic MODS with peak levels on the third and fourth days after the onset of symptoms (data not shown). With respect to the preoperative and postoperative course, procalcitonin concentrations were significantly elevated in patients with septic MODS during the immediate postoperative course (Figure 1A). A persistent procalcitonin elevation beyond the first week after the onset of symptoms was evident in nonsurvivors, whereas normal concentrations were measured in survivors (Figure 2A). In contrast, CRP did not reveal any differences between patients with or without septic MODS (Figure 1B) or in nonsurvivors and survivors (Figure 2B) in the perioperative course. The following local and systemic complications did not have a relevant effect on procalcitonin levels: intraoperative bacterial spectrum, cause of peritonitis, pulmonary failure, renal failure, and shock. To determine overall disease-specific cutoff levels, ROC analysis was based on the 2 highest consecutive procalcitonin and CRP levels reached during the observation period. In contrast to CRP, maximum procalcitonin levels were significantly higher in patients with peritonitis who developed septic MODS, experienced persisting abdominal sepsis despite surgical treatment, or subsequently died (Table 4). Procalcitonin revealed the closest correlation with septic MODS (area under the curve [AUC], 0.84; 95% CI, 0.77-0.89), and a weaker correlation was found with persisting abdominal sepsis (AUC, 0.76; 95% CI, 0.69-0.82) and nonsurvival (AUC, 0.73; 95% CI, 0.66-0.80). In contrast, corresponding CRP concentrations did not correlate with septic MODS (AUC, 0.59; 95% CI, 0.51-0.67; P<.001 vs procalcitonin), persisting abdominal sepsis (AUC, 0.60; 95% CI, 0.52-0.68; P = .07 vs procalcitonin), or nonsurvival (AUC, 0.51; 95% CI, 0.43-0.59; P = .08 vs procalcitonin). The optimum cutoff levels and the corresponding sensitivity, specificity, and positive and negative predictive values are summarized in Table 5. To assess the clinical usefulness of both markers for the early assessment of septic complications and overall outcome, procalcitonin and CRP values on the first 2 postoperative days were analyzed. 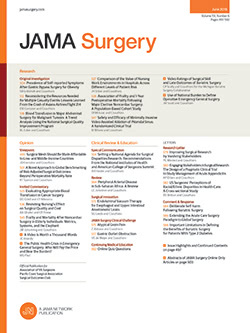 In accordance with the overall analysis, procalcitonin concentrations in patients with peritonitis were significantly higher in the first 2 postoperative days when major complications such as septic MODS, persisting abdominal sepsis, and a lethal course were observed, which was not the case for CRP. The ROC analysis was based on the peak levels of procalcitonin and CRP in the first 2 postoperative days. The ROC analysis found that procalcitonin is superior to CRP for the early postoperative assessment of septic MODS (procalcitonin: AUC, 0.84; 95% CI, 0.74-0.91; CRP: AUC, 0.53; 95% CI, 0.42-0.64; P<.001) and persisting abdominal sepsis (procalcitonin: AUC, 0.76; 95% CI, 0.65-0.84; CRP: AUC, 0.50; 95% CI, 0.39-0.61; P = .03); no difference was observed for nonsurvival (procalcitonin: AUC, 0.74; 95% CI, 0.63-0.83; CRP: AUC, 0.58; 95% CI, 0.46-0.69; P = .22). Table 6 summarizes the calculated cutoff values and the corresponding sensitivity, specificity, and positive and negative predictive values. The cumulative analysis of all procalcitonin and CRP values measured in the first, second, and third to fourth weeks identified persisting procalcitonin levels greater than 1 ng/mL as an excellent means to assess overall outcome (death) after the first week after onset of symptoms. Irrespective of the interval, procalcitonin was significantly better than CRP in assessing overall prognosis (Table 7 and Figure 3). In the present study, we report the first multicenter real-time analysis of procalcitonin for assessing septic complications in a well-defined series of patients with secondary peritonitis. The results demonstrate that procalcitonin offers distinct advantages over the widely established laboratory routine marker CRP in predicting septic MODS. This was already possible during the early course after disease onset and in the first 2 postoperative days. As far as overall prognosis in concerned, we only in part confirmed the results of other researchers who found significantly higher procalcitonin concentrations in nonsurvivors with peritonitis already in the early postoperative course.22,23 The diagnostic accuracy of procalcitonin in differentiating survivors from nonsurvivors depended on the time after disease onset and revealed a stepwise increase from the first to the third and fourth weeks. Procalcitonin concentrations greater than 1 ng/mL strongly indicated nonsurvival after the first week of peritonitis. This is identical to the findings of another recent study32 in medical ICU patients in whom corresponding inclusion criteria for study enrollment were defined. However, procalcitonin determination is no substitute for a careful history and clinical examination of the individual patient. Moreover, the cutoff levels of procalcitonin for predicting septic complications or overall prognosis are disease dependent and considerably vary among different inflammatory conditions.26 The present study also indicates that patients with “abdominal sepsis” are a heterogeneous entity in whom the individual quantitative systemic procalcitonin release considerably varies even if the clinical disease severity in terms of organ failure was the same. The large procalcitonin ranges in the septic MODS group is the main reason for the limited sensitivity of this test and has been described by many researchers.22,23,32 However, high interindividual variation is a general problem of many biochemical markers in complicated secondary peritonitis12,13,19,20,22 and explains the lack of appropriate tests in this specific setting. Procalcitonin is a nonspecific indicator of bacterial or fungal infection and sepsis and does not provide any information about the source of infection. In severe abdominal inflammation, sources other than the abdomen, such as pulmonary, urinary tract, and catheter infections, are frequently observed in critically ill patients and need to be carefully taken into account in interpreting procalcitonin measurements. Although the cellular source and pathophysiologic role of procalcitonin are still incompletely understood, increasing clinical evidence suggests that procalcitonin is no “sepsis marker” per se. Patients with acute pancreatitis and subsequent clinically relevant infection of necrosis reveal excessively high procalcitonin concentrations early after the onset of symptoms but weeks before infection is ultimately diagnosed.38 Similar observations have been made in severely burned patients and those with multiple injuries.27 In the present series, the peak concentrations of procalcitonin revealed no correlation with the sole presence of a positive intra-abdominal culture (data not shown), which further questions procalcitonin as a sepsis marker. An interesting feature becomes evident when comparing the course of procalcitonin in patients with peritonitis and septic MODS and that of patients with necrotizing pancreatitis and subsequent infection of necrosis. When patients developed severe subsequent abdominal infections, procalcitonin concentrations revealed similar dynamics, with peak levels approximately the third or fourth day after disease onset, irrespective of whether bacterially positive peritonitis or still sterile severe acute pancreatitis was present.38 It is, therefore, unlikely that bacteria or fungi are the integral triggers of procalcitonin release, although the ultimate end points culminating in septic MODS and death closely correlate with the systemic procalcitonin release. The present clinical observations are in accordance with recent experimental studies suggesting an important role of procalcitonin in the pathogenesis of severe sepsis.39,40 It could be hypothesized that the degree and persistence of systemic procalcitonin concentrations reflect an impaired immunologic response, rendering the host susceptible to severe infections or unable to overcome the initial infectious or noninfectious local insult, ultimately resulting in death. In summary, the present prospective, international multicenter study shows that monitoring of procalcitonin levels is a fast and reliable approach to assessing severe septic complications and overall prognosis in patients with secondary peritonitis. In terms of practicability, procalcitonin meets the demands of a readily available biochemical marker under clinical routine and emergency conditions. This single-test marker thus contributes to improved stratification of patients at risk for major complications of peritonitis and could further help improve clinical decision making and allocation of patients for scientific trials. Correspondence: Bettina M. Rau, MD, Department of General, Visceral, and Vascular Surgery, University of the Saarland, Kirrberger Strasse, 66421 Homburg/Saar, Germany (bettina.rau@uniklinikum-saarland.de). Author Contributions:Study concept and design: Rau, Wegscheider, and Beger. Acquisition of data: Rau, Frigerio, Bassi, Puolakkainen, Beger, and Schilling. Analysis and interpretation of data: Rau, Wegscheider, Bassi, Beger, and Schilling. Drafting of the manuscript: Rau. Critical revision of the manuscript for important intellectual content: Rau, Frigerio, Büchler, Wegscheider, Bassi, Puolakkainen, Beger, and Schilling. Statistical analysis: Wegscheider. Obtained funding: Rau and Beger. Administrative, technical, and material support: Rau, Büchler, Bassi, Puolakkainen, and Schilling. Study supervision: Frigerio, Büchler, Bassi, Puolakkainen, Beger, and Schilling. Financial Disclosure: Dr Rau has served as a consultant to and received payments from Brahms Diagnostica AG to attend meetings related to this trial, for travel expenses, and for speaking engagements. Funding/Support: This study was supported by Brahms Diagnostica AG. Acknowledgment: We thank all the study participants who contributed to recruiting patients, collecting clinical data, and analyzing procalcitonin samples in the laboratories: University of Ulm: Gerald Steinbach, MD, Department of Clinical Chemistry/Pathobiochemistry, and Astrid Bothe, MD, Department of General Surgery; University of the Saarland: Berit Kopp, RN, and Colin M. Krüger, MD, Department of General, Visceral, and Vascular Surgery, and Gerhard Pape and Felicitas Pape, Department of Clinical Chemistry; University of Verona: Anna Benini, MD, Division of Pharmacology, Department ofMedicine and Public Health; University of Helsinki: Maarit Leinimaa, RN, Research Laboratory, Department of Surgery; and University of Bern: Oliver Strobel, MD, and Christoph Müller, MD, Department of Visceral and Transplantation Surgery. We further thank Wilfried Beier, PhD, from Brahms Diagnostica AG for organizing the investigator's monitoring visits.